Everyone holds within themselves the power to change and the power to choose. With the new year just around the corner, many of us are starting to think about what we would like to accomplish in 2014. Whether it’s spending more time with family, making a career change or making healthier lifestyle choices, we often find ourselves to be our own worst enemies. In order to make change, we need to stop fighting within ourselves. While it doesn’t feel good to overeat, skip exercise or lose sleep, it does feel good when we make better choices for ourselves. Although the secret to change may be different for each of us, we all hold the ability to be mindful of our choices. We can choose to eat that extra piece of pie or not, we can choose to get a good night’s sleep or stay up late answering emails or watching TV. It seems to all come down to the power of choice and a higher awareness of our decisions. Life is a series of choices and all choices have consequences for better or for worse. 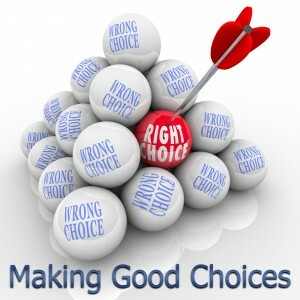 One good choice generally leads to another good decision and the opposite is true as well. A good choice over a bad choice can have a positive impact on your life and health and help you to reach your goals one step at a time. Studies show that we make an average of 70 decisions a day, most of them routine. When it comes to making defining life and lifestyle decisions many of us could use a little strategy know how. The trick is to learn to make all of our decisions relatively quickly while maintaining quality. Every decision you make is a learning opportunity. Once you make a decision, own it without regret. It’s helpful to avoid sweating the small stuff. Over thinking every little thing is not helpful and causes stress. Make the decision and monitor the outcome. If you feel good about your decision, you’re on the right track. Conversely, if you feel badly about your choice, make a better one next time. Just keep moving forward. When it comes to life changing decisions, identify your goals and objectives. Be clear and concise about what you wish to accomplish. In other words, if you want to spend more time with family, decide exactly how you are going to do that. Maybe that means getting home in time for dinner 3 nights a week. Being specific about your goals helps you to reach them. Research shows that only one in ten decisions is imperative. Taking the time to gather information and reflecting on your options leads to better decision making, often with favorable results. If you are struggling with a major decision, it may help to talk things out with one other person. Oftentimes just presenting your options to someone else helps to put things in perspective and may give you new insights into the decision. Asking another person whose opinion you value may give you another point of view and help you avoid making an error in judgment. “Life is what happens to you while you’re busy making other plans.” This quote, attributed to John Lennon, puts things in perspective. Remember, there are no perfect options. Even with the best decisions, expect the unexpected. Give yourself kudos for making informed decisions regardless of the outcome. With every decision or choice that you make, there’s another one right around the corner and the chance to make a better decision next time. This entry was posted in Health & Wellness, Home and tagged GOOD CHOICES, Professional Supplement Center, Vitamins and supplements, www.professionalsupplementcenter.com. Bookmark the permalink.